Yorkshire's Championship sides will have the chance to get their hands on some silverware before the competitive season kicks off on February 3. Eight clubs have outlined their plans to reintroduce the Yorkshire Cup, which hasn't been competed for since 1992. 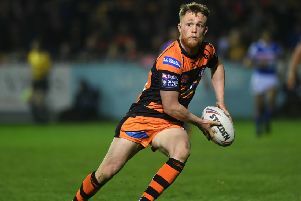 Six of the Championship's Yorkshire-based teams: Halifax, Featherstone Rovers, Dewsbury Rams, Batley Bulldogs, York City Knights and Bradford Bulls, along with League One Hunslet and amateur side Hunslet Club Parkside, will make up the eight-team tournament. The competition will be held over three consecutive weekends in January, starting on January 5. The Yorkshire Cup will kick off with two double headers on the opening weekend with York facing Hunslet Parkside and Dewsbury up against Featherstone at the Tetley's Stadium on Saturday, January 5. On Sunday, January 6 Bradford Bulls will host the second round of games with Batley playing Hunslet and Bradford taking on Halifax. The semi-finals will be drawn immediately after Bradford's clash with Halifax. Any sides knocked out in the first round of games will continue their pre-season preparations with friendlies against the other teams who fail to make the semi-finals - which will be played the following weekend. The final of the Yorkshire Cup will be contested on January 20, with the other six teams not involved playing in further friendly games. All eight clubs competing have agreed to split the gate receipts evenly, in what Batley chairman Kevin Nicholas has described as a great show of solidarity. "As part of a show of solidarity and to encourage supporters of all clubs to attend as many games as possible, the clubs have agreed to share equally all gate receipts from every game over the three-week period," said Nicholas. "In addition we are expecting that the games in week three will all be played on a different day to the Yorkshire Cup Final, to encourage everybody to attend the final, whether their team is in it or not. "We are all proud Yorkshire people and this enables us to show our love of our sport and our county for all to see. And become part of history as the Yorkshire Cup comes alive again." The Yorkshire Cup previously ran from 1905 until 1992 and was last won by Wakefield Trinity. Bradford Bulls won the old competition 11 times and current club owner Andrew Chalmers says he is "delighted" about the cup's return. He said: "We are delighted to reignite the Yorkshire Cup, a competition which resonates loudly within the rugby league community in the county. "We ourselves last played in the cup in the 1989/90 season against Featherstone. Now wouldn't that be a great throwback final." A new trophy - donated by Berry's Jewellers - has been made for the newly-formatted competition.